ABSTRACT: Existing approaches to scales in popular music do not do justice to the variety of scale collections that are used or to their expressive effects. In this article I propose a novel approach to this problem, focusing particularly on shifts of scale within songs. The idea is simple: The scale-degree content of a song (or a section of a song) tends to occupy a certain region on the “line of fifths,” the circle of fifths stretched out infinitely in both directions. Moving outside this region—especially if the move is emphasized (by rhythmic, textural, or other means) and involves multiple pitch classes—creates a sense of scalar shift. Scalar shifts can be used in a variety of ways: to delineate and reinforce sectional boundaries; to convey a change in mood or situation, simply through the shift itself, or more specifically through sharpward or flatward motion on the line of fifths; to create a momentary effect of surprise or disorientation; or to construct more complex trajectories of tension and resolution. [1.2] The surprise and reorientation caused by the VII—in addition to the shift from 3ˆ to 3ˆ in the melody—seems to suggest some kind of shift in the underlying scale or pitch collection of the song at that point; we will call this a “scalar shift.” It is not obvious, however, how to characterize this shift. From a common-practice perspective, we might be tempted to describe it as a shift from major to minor mode (or at least, as a leaning toward minor). But most theorists agree that the major/minor distinction is not really applicable to modern popular music; and in any case, the VII chord is fairly rare in common-practice minor mode. (2) One could also invoke the system of diatonic modes, but this explanation, too, is not fully satisfactory; VII combined with 3ˆ would be compatible with either Dorian or Aeolian modes, and it seems arbitrary to have to choose between them. I will argue that a more flexible approach to scalar shift is required to account for such situations. The idea is simple: The scale-degree content of a song (or a section of a song) tends to occupy a certain region on the “line of fifths,” the circle of fifths stretched out infinitely in both directions. Moving outside this region—especially if the move is emphasized (by rhythmic, textural, or other means) and involves multiple pitch classes—creates a sense of scalar shift. Such shifts may be momentary, as in the case of “Then Came You”; in other cases, they may be longer in duration, and may play a role in defining the large-scale formal structure of the song. I will argue, also, that scalar shifts often have interesting expressive implications—sometimes simply indicating a change in mood or situation, and sometimes carrying more specific emotional connotations, analogous to the expressive meanings of major and minor in common-practice music. [1.3] I stated in the opening paragraph that my aim was to explain “phenomena of composition and perception.” “Then Came You” illustrates both kinds of phenomena. On the one hand, what has to be explained is a fact of perception: the fact that the move to VII creates a feeling of surprise. (Of course, it is only with regard to my own perception that I can confidently treat this as a “fact”; I must hope that it holds true, at least to some extent, for other listeners.) But there are facts of composition to be explained as well, such as the fact that the VII chord in this example is given unusual emphasis on the musical surface (by the means described above). There may also be more general facts to be discovered about the style as a whole—for example, the fact that certain chords and scale degrees tend to occur together while others do not. The relationship between perception and composition, is of course, highly complex. Even facts about compositions—at least many things that I will treat here as facts, such as the chord progression of a song—depend ultimately on our perceptions and may be somewhat subjective. And in turn, our perceptions—such as the experience of surprise—are shaped by the compositional norms of the music we have heard. Still, the distinction between phenomena of perception and composition is a real and useful one. In what follows, I will sometimes be concerned with perceptual facts and sometimes with compositional ones, as I think the context will make clear. [1.4] For present purposes, a scale may be defined as an underlying set of scale degrees—pitch classes in relation to the tonic—that defines, or at least regulates, the harmonic and melodic content of a song or a section of a song. (3) This topic has been addressed in popular music scholarship in a variety of ways. One widely used approach centers on diatonic modes. Moore (1992, 1995, and 2001) argues that many rock songs and progressions can be understood in modal terms (usually Ionian, Mixolydian, Dorian, or Aeolian); even progressions that appear chromatic on the surface, he suggests, can often be reduced to modal prototypes. Biamonte (2010) analyzes and categorizes common chord progressions in rock from a modal perspective; Walser (1993) and Everett (2004 and 2008) also acknowledge the importance of modes in rock. Modality has also played a large role in my own work in popular music; in my book The Cognition of Basic Musical Structures (2001), I argued strongly for modality as an organizing concept in rock and listed ten well-known songs in Ionian, Mixolydian, Dorian, and Aeolian modes. I now believe, however, that the role of modal organization in rock has been somewhat overstated by these authors, myself included. In truth, I found it quite difficult to find ten well-known songs that were consistently in Dorian mode (and some of my examples are actually debatable). There are, undoubtedly, songs and sections of songs that adhere consistently to a single mode; in such cases there is nothing wrong with using modal terminology, and I will sometimes do so here. But a great many songs do not reflect modal organization, and in such cases, alternative approaches are required. [1.5] Several other approaches to pitch organization in rock have been proposed. Stephenson (2002) suggests that rock songs generally employ one of three harmonic systems or “palettes.” The natural-minor system includes the major and minor triads native to the natural-minor scale (i.e., Aeolian mode); the major system includes triads built on degrees of the Mixolydian mode; and the chromatic-minor system includes major triads built on natural-minor scale degrees. Everett (2004) posits six distinct tonal systems for rock, reflecting a stylistic range from common-practice tonality to modal, blues-based, and chromatic practices. The systems are characterized, primarily, in terms of their relationship to common-practice norms, which varies from one of strong adherence to almost complete disregard. [1.6] While the current study builds on this prior research, I attempt to go beyond previous efforts in two ways. First, I propose a novel representational system that allows precise characterization of a broad variety of scale collections. Second, I focus especially on shifts of scale collection within songs; this topic has received brief discussion (Everett 2008, 156–60; Stephenson 2002, 96–99), but deserves more attention than it has been given. While scalar shift is not an especially common device, it occurs in some of the most well-known and well-loved songs of the rock era; and it contributes in important ways to the effect and appeal of these songs, as I will try to show. [1.8] The examples in this paper span a wide stylistic range—from Motown to heavy metal to 1970s “middle-of-the-road” pop to 1980s dance music to 1990s “grunge.” Many authors have used the term “rock” as a broad stylistic category that covers much late-20th-century Anglo-American popular music, including the styles listed above, and I will do so here. “Rock” is sometimes also used more narrowly, to denote a more specific musical style. (“Then Came You,” for example, is “rock” under the broader construal but not the narrower one.) While I have elsewhere assumed the narrow understanding of “rock” (Temperley 2007 and 2011), here I employ the broader one, simply because it offers a succinct, convenient term for the range of music under consideration. [2.1] As an initial question about scales in rock, we might ask: is there some global collection of scale degrees that limits the pitch content of the style? That is, does the style of rock as a whole tend to favor certain scale degrees and avoid others? This would not imply, of course, that scale degrees outside the global collection are never used, but rather that they are heard as being foreign and destabilizing to the tonal center. An analogy could be drawn with common-practice music; while a common-practice piece may be in either major or minor, certain scale degrees—notably 2ˆ and 4ˆ—are not diatonic within either mode and are therefore unavoidably chromatic. [2.3] Some recent research allows us to bring statistical evidence to bear on the issue of rock’s global scale collection. 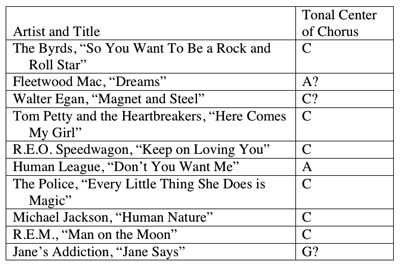 Trevor de Clercq and I (de Clercq and Temperley 2011) analyzed the harmony of 200 songs from Rolling Stone magazine’s list of the “500 Greatest Songs of All Time” (2004.). (5) We used conventional Roman-numeral notation, and made no attempt to represent notes outside the current harmony (“non-chord-tones”). Still, harmony in itself gives some indication of scale-degree content. For example, a I chord implies 1ˆ–3ˆ–5ˆ; i implies 1ˆ– 3ˆ–5ˆ; V7 implies 5ˆ–7ˆ-2ˆ–4ˆ; and so on. 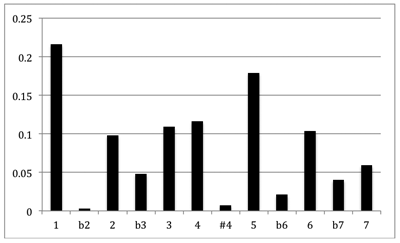 Using such data, and taking each harmonic symbol to imply a single instance of each scale degree it contains, a scale-degree distribution for rock can be created, shown in Example 3 (here enharmonic equivalence is assumed). It can be seen that this data confirms the “supermode” idea quite strongly: the 2ˆ and 4ˆ degrees are significantly less common than any other degrees. Clearly, this data should be taken with caution; it provides only an approximate picture of the distribution of scale degrees in rock. It may be that some scale degrees occur primarily as non-chord-tones and thus will be underrepresented in this count. (In some cases, too, not all the scale degrees implied by a chord are explicitly stated; not every I chord contains a 5ˆ, for example.) But this data does give some support to the idea of a global scale collection in rock containing all enharmonic scale degrees except 2ˆ and 4ˆ. [2.5] Another illustration of the “chromatic” nature of 4ˆ and 2ˆ is seen in Example 5: the chorus of “I Want a New Drug” by Huey Lewis and the News. The primary tonal center of the song is A; the progression III– VI– III tonicizes C (the VI chord might well be heard as IV of III), followed by a D major chord, IV of A, that forcefully returns us to the main tonality. This situation—with a secondary tonicization followed by a “reorienting” IV chord that reestablishes the larger tonic—is not uncommon in rock (Temperley 2011, paragraph 7.6). The question is, why does the IV have such a reorienting effect? Again, the supermode theory offers an explanation: IV contains 6ˆ (F in this case), which is 4ˆ in relation to III (C) and is therefore incompatible with that tonal center, leaving the previous tonality (A) as the only plausible alternative. [2.6] Certainly there are cases in rock where chromatic degrees ( 2ˆ and 4ˆ) actually occur—that is, where there is no plausible tonal interpretation that would avoid them. When used inconspicuously and in a clearly ornamental fashion, chromatic degrees need not undercut the tonic. For example, one often sees 4ˆ (or 5ˆ) used as a linear elaboration of 4ˆ or 5ˆ, as in the riffs to Cream’s “Sunshine of Your Love,” Deep Purple’s “Smoke on the Water,” and Aerosmith’s “Walk This Way” (Example 6a). More salient and structural uses of chromatic degrees tend to have a dramatic, even mysterious impact; consider, for example, the ominous II chords in the Moody Blues’ “Nights in White Satin” (Example 6b). (7) A highly creative use of chromatic degrees is seen in Led Zeppelin’s “Dancing Days.” The instrumental riff that precedes each verse (with a clear tonic of G) presents a prominent melodic 4ˆ, heard three times in each iteration of the motive (Example 6c). (8) The verse then modulates to C but employs a II chord, introducing 2ˆ in the bass and guitar (Example 6d). These chromatic degrees have an exotic effect, decidedly alien from the usual vocabulary of rock. Interestingly, these chromatic pitches— 4ˆ of G in the riff and 2ˆ of C in the verse—are enharmonically the same pitch class (C /D ). Yet, to my ears at least, they sound like quite different pitches. (9) Examples such as this seem to confirm the reality of enharmonic distinctions in rock; this argues in favor of a linear representation of fifth relations (i.e., the line of fifths), which represents enharmonic distinctions, as opposed to a circular one, which does not. [3.1] While the supermode operates as a global constraint on scale-degree content in rock, most songs do not use this entire collection but are confined to a smaller collection within it. Our focus in the remainder of this essay will be on these smaller collections, and in particular, on the ways that songs shift from one collection to another. I distinguish between momentary shifts, where a songs shifts rather briefly out of its primary collection and then shifts back, and sectional shifts, where the new collection is maintained over an entire section of the song. [3.2] As a first example of sectional scalar shift, consider the Beatles’ “A Hard Day’s Night” (Example 7). Example 8 shows a way of representing scalar shifts that will be employed repeatedly in the analyses that follow. Each scale collection is shown as a horizontal array of rectangles on the line of fifths; successive collections within a song are represented in chronological order from top to bottom. (Lyrics and other information are shown at right.) The main repeating section of “A Hard Day’s Night” uses the chords I, IV, and VII, thus employing the complete Mixolydian mode; the V chord occurs once at the end. (As I have done elsewhere [Temperley 2011], I will use the term “verse-chorus unit” or “VCU” to refer to the main repeating section of a song; I do so even when the “chorus” of the section might more aptly be described as a “refrain,” as is the case here.) The melody of the VCU also stays mainly within the Mixolydian mode, though there is a brief use of 7ˆ (over the V chord) and a very noticeable move to 3ˆ at the end. (The vocals also touch on some chromatic degrees in the third phrase— 5ˆ/ 6ˆ and 1ˆ/ 2ˆ—but these are so fleeting as to warrant no inclusion in the scale-degree representation.) Thus the scale-degree content of the section spans a range on the line of fifths from 3ˆ to 7ˆ. The bridge, by contrast, excludes 7ˆ and 3ˆ and stays squarely within the major mode; here, 7ˆ occurs prominently in both the melody and harmony. [3.3] Some explanation is needed of the representation shown in Example 8. Clearly, this representation is a blunt instrument, indicating the scale-degree content of a song or section only in a highly abstract form. It says nothing about how scale degrees are used: whether they are present in the accompaniment or melody (or both), whether they are chordal or non-chordal, whether they are part of the tonic triad, whether they are used repeatedly or only once, and so on. I do not deny the importance of these factors—from a purely musical viewpoint, obviously, and from an expressive viewpoint as well; I will return to this issue at the end of the essay. For the present, however, the mode of representation shown in Example 8 conveys the essential information, namely, which scale degrees are present and which ones are not. It also has a flexibility that is lacking in traditional systems of modes and scales. 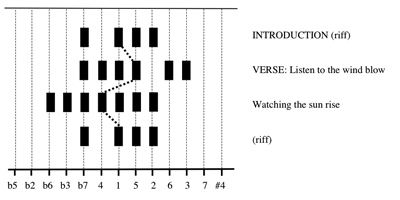 In “A Hard Day’s Night,” for example, the pitch content of the verse-refrain cannot be neatly characterized with diatonic modes, as it employs both 3ˆ and 3ˆ, and both 7ˆ and 7ˆ; the line-of-fifths representation (however flawed) is superior in this respect. [3.5] Returning to “A Hard Day’s Night,” the shift in scale-degree content between the verse-refrain and bridge serves a clear structural function: it reinforces the contrast between the two sections, thus helping to clarify the formal structure of the song. But I would argue that it serves an important expressive function as well. While the verse-refrain mainly focuses on the drudgery of the “hard day”—“working like a dog”—the bridge turns to the payoff of the night, when “everything seems to be right.” The “sharpward” move (i.e., in the sharp direction) on the line of fifths here poignantly conveys this shift in mood. (12) To say simply that the pitch collection of the bridge “moves in the sharp direction” in relation to the verse-refrain might seem questionable. (The sharp-side endpoint of the collection actually stays the same; only the flat-side endpoint changes.) What is important, I would argue, is the mean position or “center of gravity” of the collection on the line of fifths (as suggested in Temperley 2001, 340–43); and this does shift, as shown in Example 8. [3.6] A number of other songs feature scalar shifts quite similar to that seen in “A Hard Day’s Night.” Two other early Beatles songs, “Can’t Buy Me Love” and “I Feel Fine,” present VCUs featuring both ^b3 and ^3 and favoring 7ˆ over 7ˆ; in the bridge, major mode then predominates. (In “Can’t Buy Me Love,” 3ˆ briefly enters the bridge on the phrase “everybody tells me so.”) In both of these songs, as in “A Hard Day’s Night,” iii chords in the bridge give particular emphasis to both the 3ˆ and 7ˆ scale degrees. (13) Similar shifts are seen also in other songs: In the Who’s “I Can’t Explain,” Electric Light Orchestra’s “Don’t Bring Me Down,” Heart’s “Crazy on You,” and Supertramp’s “Take the Long Way Home,” a VCU emphasizing 7ˆ and 3ˆ alternates with a major-mode bridge. The Beatles’ “Here Comes the Sun” reflects the opposite pattern: the VCU is in major mode while the bridge employs the “flat-side” harmonies III and VII. While convincing connections with the lyrics cannot always be drawn in these songs, in every case the shift functions structurally to articulate sectional boundaries and provide large-scale contrast within the song. [3.7] Scalar shifts may also occur between verse and chorus. A highly effective example is Kenny Rogers’ “Love Will Turn You Around,” which moves from a Mixolydian verse (with a touch of 3ˆ at the end) to a chorus in Ionian (Example 10). This scalar shift nicely complements the melodic contrast between the two sections: the rather cramped melody of the verse (confined mainly to a range of a major third) opens up to a soaring, expansive chorus. Duran Duran’s “Rio” provides another artful example of scalar shift between verse and chorus (see Example 11). The verse melody is minor pentatonic, while the accompaniment uses both VI (with 6ˆ) and IV (with 6ˆ); the chorus outlines the progression I–V– VII–IV in both melody and accompaniment, combining 7ˆ and 7ˆ. This is another case where the scales at issue cannot be adequately described in conventional diatonic or pentatonic terms. The arpeggiating synthesizer licks that flicker in the background throughout the song—most conspicuously in the thinly-textured passages between sections—employ just 1ˆ, 2ˆ, and 5ˆ, compatible with both the verse and chorus collections. [3.9] A curious case of verse-chorus scalar shift is seen in Katy Perry’s “Firework.” The verse progression, I– VII–vi–IV, establishes Mixolydian mode, as the lyrics project commiseration and sympathy (“Do you ever feel like a plastic bag”); the chorus, by contrast, has an inspirational, pep-talk character (“Baby you’re a firework, come on show ’em what you’re worth”), as the harmony switches to a I–ii–vi–IV progression. To my ears, the chorus progression creates a decidedly brighter, more positive feel than that of the verse, though the two differ by only one chord ( VII versus ii). One might characterize this as a shift from Mixolydian to major. But in fact there is no use of ^7 in the chorus, either in the melody or in the accompaniment; rather, the chorus is confined to the collection 1ˆ–2ˆ–3ˆ–4ˆ–5ˆ–6ˆ, what I will call the “Major-no-7ˆ” collection. (14) (The melody remains within this collection throughout both the verse and chorus.) One could perhaps argue that 7ˆ is implied, but this is questionable and, under the current framework, unnecessary; even a shift from Mixolydian to Major-no-7ˆ represents a shift in center of gravity on the line of fifths (albeit small), as shown in Example 14. Thus a change in expressive implication is predicted. A similar verse-chorus shift from Mixolydian to Major-no-7ˆ is seen in James Taylor’s “Fire and Rain,” though this case is more complex; the mostly Mixolydian verse contains a brief occurrence of V (with 7ˆ), and the Mixolydian collection returns at the end of the chorus. While the verse lyric conjures a sleazy atmosphere of strip joints and pool halls, the pre-chorus focuses on the object of the singer’s affection—a single dancer whose beauty and purity set her apart from the rest. [4.2] It is not obvious how momentary scalar shifts such as the one in “Then Came You” should be characterized under the current framework; there are several possibilities. One could posit a scalar collection including only the pitches of the chord segment itself, as shown in Example 16; see also Example 17a. (16) Alternatively, one could say that this segment invokes a larger collection, though it is sometimes not easy to say what that collection would be; Example 17b shows Dorian mode. 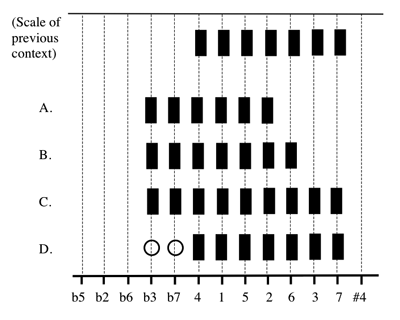 Another possibility would be to add the pitches of the VII segment to the scale of the prior context (Example 17c). Or one could say that the “foreign” pitches of the segment are simply outside the scale, and that the previous scalar framework remains in force (Example 17d). It is difficult to decide between these options; I favor the first. Notably, however, all four options have something in common: They represent the scale-degree content of the VII segment as moving in the flatward direction in relation to the previous measures. And in this sense, all of the representations of the VII segment in Example 17 capture its surprising and disruptive effect. [4.3] In harmonic terms, “Then Came You” could be characterized as a major-mode verse-chorus that moves to VII at the end of the chorus. This is in fact a common pattern in popular songs of the 1970s. 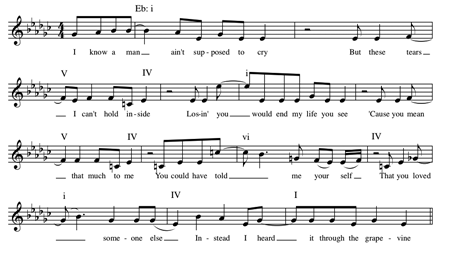 In the Commodores’ “Easy” and Nazareth’s “Love Hurts” (Example 18a), the end of the chorus features VII moving to IV and then to I, just as in “Then Came You”; in Diana Ross’s “Touch Me in the Morning,” VII moves to V (Example 18b). A move to VI (in a major-mode context) can create a similar effect, as seen at the end of the chorus in Elton John’s “Goodbye Yellow Brick Road” (Example 18c); the end of the final chorus of the Beatles’ “With a Little Help from my Friends” offers another fine example. It is notable that all of these cases feature a momentary shift in the flat direction. Momentary sharpward shifts are more difficult to find. (17) One example is in Dire Straits’ “Money for Nothing” (Example 18d). Here, the minor pentatonic scale that forms the primary collection for the song is interrupted by a vi chord (just an open fifth), introducing the 3ˆ and 6ˆ degrees. In each of these cases, the momentary shift occurs right at the end of the chorus of the song, and is followed by a return to the song’s primary scale. [4.4] Often momentary scalar shifts receive rhetorical reinforcement of some kind, which seems to acknowledge their dramatic and surprising effect. The eighth-note reiteration of the VII chord in “Then Came You” has already been mentioned. In “Goodbye Yellow Brick Road,” the VI chord is expanded to two measures, creating a five-measure phrase and disrupting the preceding four-measure hypermeter; in “Money For Nothing,” the vi chord is itself a kind of phrase expansion, falling in the fifth measure of the phrase and (again) creating a hypermetrical irregularity. [4.5] An exquisite sharpward momentary shift is seen in Marvin Gaye’s “Heard it Through the Grapevine”; Example 19 shows the second VCU. The scale of the verse is primarily Dorian; the V chords of the accompaniment add 7ˆ. Moving into the end of the verse (or perhaps the pre-chorus), the harmony shifts to vi, reflected in the 3ˆ (G) of the vocal; 6ˆ (C) is emphasized in both the melody and the bass. (Though 6ˆ is present in the “Dorian+7ˆ” collection as well, it is toward the sharp end of the collection; thus emphasizing it creates a “sharpward” inclination.) The lyric here, “You could have told me yourself,” is particularly poignant—a wistful contemplation of what might have been—and the major-mode leaning of the music captures it perfectly. (18) (Note also the shift in Gaye’s vocal timbre from the rather harsh quality of the preceding and following lines to a pure falsetto on the syllable “told.”) The abrupt return to 3ˆ in the following phrase (“that you loved someone else”) brings us back to cruel reality. In the chorus, the vocal consistently uses 3ˆ, but the accompaniment employs 3ˆ throughout, thus merging the two collections of the verse. 5. Scalar Shift or Mixed Collection? [5.1] A difficult issue, and one that arises fairly frequently, is illustrated by Example 21—the end of the chorus of “Woodstock,” by Crosby, Stills, Nash, & Young. The VCU up to this point has employed a Dorian collection, using 3ˆ rather than 3ˆ (and with prominent IV chords). The end of the chorus, however, moves emphatically to major tonic harmony—dramatically emphasized by the sustained 3ˆ in the uppermost vocal line. As with other examples discussed earlier, it is unclear how this situation should be characterized under the current framework. Should we posit a momentary shift in scale, or should we assign a single scale collection, containing both 3ˆ and 3ˆ, to the entire section? While most songs and song sections employ just one form of the third degree, there are certainly cases where 3ˆ and 3ˆ are featured in close proximity or even simultaneously. In the Beatles’ “Can’t Buy Me Love,” for example, 3ˆ in the vocal is juxtaposed with 3ˆ in the accompaniment throughout the verse. In such cases, a scale collection including both 3ˆ and 3ˆ—what I will call a “mixed” collection—seems unavoidable. (I will use this term for any collection containing two forms of the same diatonic scale degree.) Several other song sections discussed earlier also employ mixed collections, such as the verse-refrain of “A Hard Day’s Night” (Example 7) and the verse and chorus of Duran Duran’s “Rio” (Example 11). I favor a “mixed collection” analysis in Example 21 as well, including both 3ˆ and 3ˆ in the scale; one reason for doing so will be discussed below. [5.3] A somewhat similar issue arises with 6ˆ and 6ˆ. Here, too, one sometimes finds a section that predominantly uses 6ˆ, but momentarily switches to 6ˆ. Two examples are seen in Example 22; in both cases, the 6ˆ that predominates throughout the chorus gives way to 6ˆ at the very end. Again, I would suggest that the function of the 6ˆ here is primarily harmonic: for reasons that are not obvious, the IV chord in plagal (IV–I) cadences in rock is nearly always major (Temperley 2011). The 6ˆ (D) in “Rikki Don’t Lose That Number” is part of a plagal stop cadence, a common harmonic device in rock which involves a “stop” in the instruments and a sectional overlap in the vocal (Temperley 2011); again, this gesture almost always involves IV rather than iv. (21) (If one imagines the passage with iv at the end rather than IV, it can be seen how the cadential effect is weakened.) A similar argument could be made for “No Excuses”; even though there is arguably no real cadence here (since the vocal does not overlap into the next section), the major IV chord invokes the schema of the rock plagal cadence and thus gives a certain closural effect. [5.4] Another common situation involving mixed scale collections is illustrated by the songs in Example 23. Each of these songs features a chromatic line that descends from the tonic (to 6ˆ in the first case, to 5ˆ in the second); thus both 7ˆ and 7ˆ are used, as well as 6ˆ and 6ˆ. In “Always Something There To Remind Me,” the chromatic line is in the bass; in “Hotel California,” it is in an inner voice of the texture. As others have discussed, these somewhat unusual harmonic juxtapositions can be explained as arising from the underlying linear pattern. (See, in particular, Everett 2008, 149–51, for discussion and many examples.) However, the idea that scale degrees arise from chromatic linear motions (or from cadential harmonic gestures, as discussed above) does not mean that they cannot have expressive meaning as well. Every scale degree in a collection, in my view, is heard in relation to a certain position on the line of fifths, and consequently has potential expressive implications. Passages such as those in Example 23 span a range on the line of fifths from 6ˆ to 7ˆ; this span contains the entire supermode and is therefore equivocal in expressive terms (though the wide span may, in itself, create a sense of instability). But the expressive effect of such a collection may still vary depending on the relative emphasis of degrees within the span, and in particular, on whether 3ˆ or 3ˆ is used. The 3ˆ in “Hotel California” evokes a dark and ominous atmosphere, whereas 3ˆ in “Always Something There to Remind Me” creates a lighter mood. [5.5] A mixed scale collection can sometimes project an ambivalent, even bittersweet expressive quality. A wonderful example of this is seen in the chorus of Alanis Morissette’s “You Oughta Know” (Example 24). The verse of the song presents three distinct melodic ideas in succession, all emphasizing 3ˆ (in both vocal and accompaniment) rather than 3ˆ, as the singer angrily berates her selfish and hypocritical former boyfriend. At the beginning of the chorus (the first downbeat of the example), 3ˆ gives way to 3ˆ. The function of this 3ˆ is, in part, harmonic, reinforcing the structurally important I at the beginning of the chorus; but it has clear expressive implications as well, as the singer revels in her survival (“and I’m HERE”) and enjoys the momentary revenge of embarrassing her ex-lover “in the middle of dinner.” Significantly, 3ˆ does not completely replace 3ˆ in the chorus; rather, the two coexist in an uneasy balance. Despite the moment of triumph, an undercurrent of anger and bitterness still remains. [5.6] I have suggested that many songs and song sections that appear to alternate between two versions of a scale degree (such as 3ˆ/ 3ˆ or 6ˆ/ 6ˆ) are best viewed as having a “mixed” scale collection containing both versions. The choice of one version or the other at a particular moment may then be guided by a variety of considerations—harmonic, linear, or expressive. The assumption here, as it has been elsewhere in the article, is that the emotional connotations of a section, at least with regard to pitch content, arise primarily from the scale collection itself. While I find this view convincing in many cases, it is also open to question. In some cases, the momentary emphasis of one version of a degree over another within a mixed collection has a clear expressive impact. Consider, for example, the joyful effect of 3ˆ at the end of the chorus of “Woodstock” (Example 21), which perfectly reflects the sentiment of the song—an ever-growing crowd heading toward Woodstock for “song and celebration.” Indeed, throughout this article, I have drawn attention to the prominence or emphasis of particular degrees within a collection, implying that this has expressive import. This is difficult to reconcile with the idea that expressive effects arise solely from the scale collection itself. Alternatively, one might attribute expressive effects directly to the notes that are being used, rather than to the underlying scale. But this view, too, seems unsatisfactory. If expressive meaning arose directly from sounding pitches, we should experience a constant shifting of expressive content from chord to chord and from note to note in a melody; this is not generally the case, in my opinion. In many cases, the scale-degree content of a section seems to impart a certain character to the entire section that is relatively unaffected by slight emphases of one degree over another. [5.8] My final example in this section features a particularly effective use of scale-degree mixture, and a particularly mysterious one. The riff of Fleetwood Mac’s “The Chain” employs just scale degrees 1ˆ, 2ˆ, 5ˆ, and 7ˆ (Examples 25 and 26). This is a somewhat neutral scale collection in expressive terms, as it employs neither the raised nor the lowered versions of 3ˆ and 6ˆ; in this context, it creates a cold and austere effect. The vocals enter on a Idom7 chord (or V7/IV? ), moving to IV; the addition of 3ˆ and 6ˆ creates a sharpward leaning. (The IV chord features the “overtone-series” voicing of a major triad, but it is on subdominant harmony, not tonic; the result is intense and impassioned, but hardly joyful.) This is immediately followed by i and iv6, replacing 3ˆ and 6ˆ with 3ˆ and 6ˆ and pulling the collection violently flatward. The riff then resumes, restoring the neutral 1ˆ–2ˆ–5ˆ– 7ˆ collection and leaving the flat-side/sharp-side conflict of the previous measures unresolved. (I am unsure whether to represent these changes as scalar shifts or as shifts of emphasis within a single collection; Example 26 adopts the former approach.) Note, once again, the “S-shaped” trajectory on the line of fifths. The 3ˆ/ 3ˆ and 6ˆ/ 6ˆ juxtapositions here are not easily explained, either in harmonic or linear terms, nor can their emotional connotations be easily articulated; but their sheer beauty and expressive power cannot be denied. [6.1] My aim in this essay has been to offer a new and more satisfactory account of scalar structures in rock. The central feature of this approach is the use of the line of fifths as a cognitive representation of scale collections. I have argued that this allows for a more flexible representation of pitch collections than traditional systems of modes and scales. It also captures, in a very natural way, the expressive connotations of scales, which depend in large part on their position or “center of gravity” on the line of fifths. I have suggested that shifts between scales within a song are an important resource in rock composition. They can be used in a variety of ways: to delineate and reinforce sectional boundaries; to convey a change in mood or situation, simply through the shift itself, or more specifically through sharpward or flatward motion on the line of fifths; to create a momentary effect of surprise or disorientation; or to construct more complex trajectories of tension and resolution. Sometimes, I have suggested, apparent shifts in scalar content may better be regarded as alternations within the same scale, though even then, the emphasis of particular degrees within the scale may have expressive implications. [6.2] In part, my argument for the cognitive reality of the line-of-fifths representation has been based on perceptual evidence; I have suggested that it captures important features of the listening experience, such as the surprising effect of the VII chord in “Then Came You.” But I have also pointed to evidence that creators of rock music have been influenced by “line-of-fifths” thinking—as reflected, for example, in connections between music and text in songs like “A Hard Day’s Night” and “Mainstreet,” and in the rhetorical reinforcement of chords that move outside the previously established scale. I have noted that it is sometimes difficult to decide with certainty how a scalar shift should be represented—whether a shift occurs, where it occurs, and exactly what scales are involved. This may make the theory somewhat frustrating to use from an analytical perspective. But I would argue it does not detract from the theory’s cognitive plausibility. Quite likely, scalar representations are somewhat ambiguous in the minds of composers and listeners as well. As noted with regard to “Then Came You,” the important thing is simply the presence of a shift and its direction on the line of fifths; and in many cases, alternative analyses lead to the same predictions in this regard. [6.3] Clearly, what I have proposed here is just one aspect of the expressive language of rock—an expressive language that appears to be very rich and complex. Many other aspects of pitch organization—such as the shape of a melodic phrase, a repeated motive, or a clash between melody and harmony—may have expressive meaning, to say nothing of other parameters such as rhythm and timbre. It may seem, also, that the expressive interpretation of scale collections proposed here—based entirely on the one-dimensional “happiness axis”—is rather simplistic. It is worth noting that many studies have found happiness—or “valence,” as it is sometimes called—to be one of the basic dimensions underlying musical emotion, and indeed emotion in general. (23) And of course, the lyrical and musical context in which a scale is used may give it a richer and more specific emotional meaning. Still, it is possible that scales themselves carry expressive associations that go beyond the “valence” dimension; this deserves further study. [6.4] Aside from the global constraint of the supermode, we have said little so far about constraints or norms concerning the scale collections that are used in rock. It seems clear that some collections are more common than others; in particular, scales that form compact sets on the line of fifths are particularly favored. This of course includes diatonic and pentatonic collections, whose prevalence in rock is well known, but it also includes hexatonic scales such as the “Major-no-7ˆ” collection seen in “Firework” (Example 14) and compact “mixed” collections such as those in the verse and chorus of “Rio” (Example 11). Among diatonic collections, Spicer (2009) has argued that the Ionian and Aeolian modes are especially normative in rock, and I concur. Consider Example 4 once again; it was noted that F is an impossible tonal center for this progression, due to the presence of B ( 4ˆ of F), and that songs featuring this progression in the verse generally establish an alternative tonality in the chorus (see Table 1). It is noteworthy that this tonal center is most often C, never D, and rarely A or G—though given just the supermode, the pitch collection of Example 4 should be compatible with all of these tonalities. In effect, a tonality of C interprets the F–G progression as being in Ionian mode; the preference for this interpretation seems to point to the primacy of the major scale collection in rock. [6.6] I have focused here on a particular aspect of pitch organization, scale collection, and the structural and expressive possibilities afforded by shifts in scale. But another very important aspect of the pitch organization of a song is the tonal center itself; and this too may shift. Changes of tonal center—what I will call “tonal shifts”—are not at all uncommon in rock. (25) Many songs feature different tonal centers in the verse and chorus: the Beatles’ “Penny Lane,” Derek and the Dominoes’ “Layla,” Elton John’s “Rocket Man,” and the Police’s “Don’t Stand So Close To Me” are just a few well-known examples. At first blush, it appears that tonal shifts function in many of the same ways as scalar shifts: to articulate structural boundaries, to create surprise or tension, and for expressive purposes as well. But what, then, is the relationship between scalar shifts and tonal shifts? The issue of expression is of particular interest here: If a shift from C Mixolydian to C Aeolian carries negative connotations because of the flatward shift on the line, what is the expressive meaning of a change from C Mixolydian to E Ionian, which entails the same shift of pitch collection (in absolute terms) but shifts in tonal center as well? What are the expressive implications when a song contains both scalar and tonal shifts—the Beatles’ “Penny Lane,” for example, which features a flatward scalar shift within the verse and then shifts tonally down a whole step for the chorus? [6.7] Scalar shift and tonal shift are interrelated in another way as well. Consider, one final time, the progression VII–IV–I. I suggested earlier that this progression is sometimes used, in a major-mode context, to create a moment of tension and drama at the end of a chorus, as exemplified in “Then Came You” (Example 1) and “Love Hurts” (Example 18a). I attributed this effect to the implied scalar shift, introducing 7ˆ into an Ionian context. But another way to view this pattern is from the perspective of tonal shift—as a momentary implication or “tonicization” of IV (thus treating the VII as IV of IV—in common-practice language, an “applied chord”). This view is more plausible in some cases than others. In “Then Came You,” the emphasis on the VII chord itself, as well as the outlining of the minor tonic triad in the vocal (especially in Example 1b), seems to thwart any tonicization of IV. In “Love Hurts,” by contrast, the grouping of VII and IV into a single vocal gesture encourages us to hear the former as an elaboration of the latter, supporting the “tonicization” hearing; indeed, I have argued for such an interpretation elsewhere (Temperley 2011). By this view, the sense of reorientation caused by the VII is caused not by a shift of scale-degree content in relation to the tonal center, but by a shift in the tonal center itself. (26) This is another way, then, that tonal shift and scalar shift are intertwined: in some cases, it is not obvious which of these two phenomena is involved. It may be, indeed, that the two are not mutually exclusive, and that both forces can be at work in our perception of a passage. [6.8] Whatever the answers to these questions, the expressive implications of changes in pitch organization—tonal or scalar—deserve much more attention than they have received. Our experimental work (Temperley and Tan, forthcoming) suggests that listeners—even untrained listeners—are sensitive even to quite subtle shifts in pitch organization and to their expressive connotations. Thus further research in this area may yield important insights into the expressive language of popular music, and may also shed light on broader issues of musical meaning and experience. Björnberg, Alf. 1985. “On Aeolian Harmony in Contemporary Popular Music.” IASPM Nordic Branch Working Paper No. 1. Boone, Graeme. 1997. “Tonal and Expressive Ambiguity in ‘Dark Star.’” In Understanding Rock, ed. John Covach and Graeme M. Boone, 3–31. New York: Oxford University Press. Burns, Lori. 2008. “Analytic Methodologies for Rock Music: Harmonic and Voice-Leading Strategies in Tori Amos’s ‘Crucify.’” In Expression in Pop-Rock Music: Critical and Analytical Essays, 2nd ed., ed. Walter Everett, 63–92. London: Routledge Press. Capuzzo, Guy. 2009. “Sectional Tonality and Sectional Centricity in Rock Music.” Music Theory Spectrum 31, no. 1: 157–74. Covach, John. 1997. “Progressive Rock, ‘Close to the Edge,’ and the Boundaries of Style.” In Understanding Rock, ed. John Covach and Graeme M. Boone, 171–210. New York: Oxford University Press. de Clercq, Trevor, and David Temperley. 2011. “A Corpus Analysis of Rock Harmony.” Popular Music 30, no. 1: 47–70. Doll, Christopher. 2009. “Transformation in Rock: An Explanatory Strategy.” Gamut 2, no. 1.
http://trace.tennessee.edu/gamut/vol2/iss1/1 (accessed 29 November 2011). http://www.mtosmt.org/issues/mto.04.10.4/mto.04.10.4.w_everett.html (accessed 29 November 2011). Everett, Walter. 2008. “Pitch Down the Middle.” In Expression in Pop-Rock Music: Critical and Analytical Essays, 2nd ed., ed. Walter Everett, 111–74. London: Routledge Press. —————. 2008. “Pitch Down the Middle.” In Expression in Pop-Rock Music: Critical and Analytical Essays, 2nd ed., ed. Walter Everett, 111–74. London: Routledge Press. “The 500 Greatest Songs of All Time.” 2004. Rolling Stone 963: 65–165. Gabrielsson, Alf, and Erik Lindström. 2001. “The Influence of Musical Structure on Emotional Expression.” In Music and Emotion: Theory and Research, ed. Patrick Juslin and John Sloboda, 223–48. Oxford: Oxford University Press. Koozin, Timothy. 2008. “Fumbling Towards Ecstasy: Voice Leading, Tonal Structure, and the Theme of Self-Realization in the Music of Sarah McLachlan.” In Understanding Rock, ed. John Covach and Graeme M. Boone, 267–84. New York: Oxford University Press. Lerdahl, Fred. 2001. Tonal Pitch Space. New York: Oxford University Press. Middleton, Richard. 1972. Pop Music and the Blues. London: Victor Gallance. Moore, Allan. 1995. “The So-Called ‘Flattened Seventh’ in Rock.” Popular Music 14, no. 2: 185–201. —————. 1995. “The So-Called ‘Flattened Seventh’ in Rock.” Popular Music 14, no. 2: 185–201. Moore, Allan. 2001. Rock: The Primary Text: Developing a Musicology of Rock, 2nd ed. Aldershot: Aldgate. —————. 2001. Rock: The Primary Text: Developing a Musicology of Rock, 2nd ed. Aldershot: Aldgate. Regener, Eric. 1974. “On Allen Forte’s Theory of Chords.” Perspectives of New Music 13, no. 1: 191–212. Spicer, Mark. 2008. “Large-Scale Strategy and Compositional Design in the Early Music of Genesis.” In Expression in Pop-Rock Music: Critical and Analytical Essays, 2nd ed., ed. Walter Everett, 313–44. London: Routledge. Spicer, Mark. 2009. “Absent Tonics in Pop and Rock Songs.” Paper presented at the annual meeting of the Society for Music Theory, Montreal. —————. 2009. “Absent Tonics in Pop and Rock Songs.” Paper presented at the annual meeting of the Society for Music Theory, Montreal. Stephenson, Ken. 2002. What to Listen for in Rock: A Stylistic Analysis. New Haven: Yale University Press. Temperley, David. 2001. The Cognition of Basic Musical Structures. Cambridge, MA: MIT Press. Temperley, David. 2011. “The Cadential IV in Rock.” Music Theory Online 17, no. 1.
http://www.mtosmt.org/issues/mto.11.17.1/mto.11.17.1.temperley.html (accessed 29 November 2011). —————. 2011. “The Cadential IV in Rock.” Music Theory Online 17, no. 1. Temperley, David, and Daphne Tan. In press. “The Emotional Connotations of Diatonic Modes.” Music Perception. Wagner, Napthali. 2003. “‘Domestication’ of Blue Notes in the Beatles’ Songs.” Music Theory Spectrum 25, no. 2: 353–65. Walser, Robert. 1993. Running with the Devil: Power, Gender, and Madness in Heavy Metal Music. Hanover, NH: Wesleyan University Press of New England. Walser, Robert. 2003. “Forging Masculinity: Heavy-Metal Sounds and Images of Gender.” In Sound and Vision: The Music Video Reader, ed. Simon Frith and Lawrence Grossberg, 153–81. London: Routledge. —————. 2003. “Forging Masculinity: Heavy-Metal Sounds and Images of Gender.” In Sound and Vision: The Music Video Reader, ed. Simon Frith and Lawrence Grossberg, 153–81. London: Routledge. Aerosmith. 1975. “Walk This Way.” Songwriters Joe Perry and Steven Tyler. On Toys in the Attic. Columbia. Alice in Chains. 1994. “No Excuses.” Songwriter Jerry Cantrell. On Jar of Flies. Columbia. The Beatles. 1964. “A Hard Day’s Night.” Songwriters John Lennon and Paul McCartney. On A Hard Day’s Night. Capitol. Crosby, Stills, Nash, and Young. 1970. “Woodstock.” Songwriter Joni Mitchell. On Déjà Vu. Atlantic. Dire Straits. 1985. “Money for Nothing.” Songwriters Mark Knopfler and Sting. On Brothers in Arms. Warner Brothers. The Doobie Brothers. 1973. “China Grove.” Songwriter Tom Johnston. On The Captain and Me. Warner Brothers. The Doors. 1967. “Light My Fire.” Songwriters Jim Morrison, John Densmore, Ray Manzarek, and Robby Krieger. On The Doors. Elektra. Duran Duran. 1982. “Rio.” Songwriter Andy Taylor, John Taylor, Nick Rhodes, Roger Taylor, and Simon LeBon. On Rio. Capitol. The Eagles. 1977. “Hotel California.” Songwriters Don Felder, Don Henley, and Glenn Frey. On Hotel California. Asylum. Fleetwood Mac. 1977. “The Chain.” Songwriters Christine McVie, John McVie, Lindsey Buckingham, Mick Fleetwood, and Stevie Nicks. On Rumours. Warner Brothers. Gaye, Marvin. 1968. “I Heard it Through the Grapevine.” Songwriters Barrett Strong and Norman Whitfield. On In the Groove. Tamla. John, Elton. 1973. “Goodbye Yellow Brick Road.” Songwriters Elton John and Bernie Taupin. On Goodbye Yellow Brick Road. MCA. Led Zeppelin. 1973. “Dancing Days.” Songwriters Jimmy Page and Robert Plant. On Houses of the Holy. Atlantic. Lewis, Huey, and the News. 1983. “I Want a New Drug.” Songwriters Chris Hayes and Huey Lewis. On Sports. Chrysalis. The Moody Blues. 1967. “Nights in White Satin.” Songwriter Justin Hayward. On Days of Future Passed. Deram. Morissette, Alanis. 1995. “You Oughta Know.” Songwriters Alanis Morissette and Glen Ballard. On Jagged Little Pill. Maverick. Naked Eyes. 1983. “Always Something There to Remind Me.” Songwriters Burt Bacharach and Hal David. On Burning Bridges. EMI. Nazareth. 1975. “Love Hurts.” Songwriter Boudleaux Bryant. On Hair of the Dog. A&M. Perry, Katy. 2010. “Firework.” Songwriters Katy Perry, Mikkel S. Eriksen, Tor Erik Hermansen, Sandy Wilhelm, and Ester Dean. On Teenage Dream. Capitol. The Police. 1983. “Synchronicity II.” Songwriter Sting. On Synchronicity. A&M. Rogers, Kenny. 1982. “Love Will Turn You Around.” Songwriters Kenny Rogers, David Malloy, Thom Schuyler, and Even Stevens. On Love Will Turn You Around. Liberty. Diana Ross. 1973. “Touch Me in the Morning.” Songwriter Michael Masser and Ron Miller. On Touch Me in the Morning. Motown. Rush. 1980. “The Spirit of Radio.” Songwriter Neil Peart, Geddy Lee, and Alex Lifeson. On Permanent Waves. Mercury. Seger, Bob, and The Silver Bullet Band. 1977. “Mainstreet.” Songwriter Bob Seger. On Night Moves. Capitol. Steely Dan. 1974. “Rikki Don’t Lose That Number.” Songwriters Donald Fagen and Walter Becker. On Pretzel Logic. ABC. Warwick, Dionne, and The Spinners. 1974. “Then Came You.” Songwriters Philip Pugh and Sherman Marshall. On Then Came You. Atlantic. 1. Following a common convention, I represent major triads with upper-case Roman numerals, minor triads with lower-case. 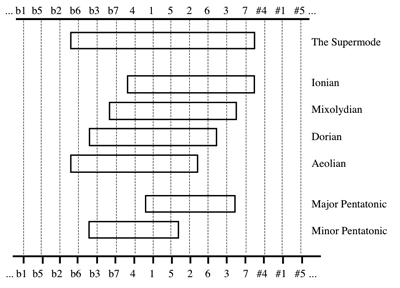 Scale degrees and roots within the major scale are represented by plain integers and Roman numerals, respectively; others are indicated by a preceding “ ” or “ ”. Keys are represented as pitch classes only, not as major or minor; this will be explained below. 2. Note that common-practice minor is not the same as Aeolian mode, or any other diatonic mode; it is most closely approximated by the harmonic minor scale (1ˆ–2ˆ– 3̂–4ˆ–5ˆ– 6ˆ–7ˆ), but also has distinct ascending and descending melodic scales. (Alternatively, and perhaps preferably, it can be viewed as having a single scale with a flat third and variable sixth and seventh degrees.) The application of the major/minor system to rock is discussed and rejected by Covach (1997, 10–11), Stephenson (2002, 42–3), and Burns (2008, 65). This point is also often made implicitly: theorists who propose tonal classification schemes for popular music generally do not use major and minor keys, but rather employ either diatonic modes or alternative custom-made systems. See for example Moore 1992, Stephenson 2002, and Everett 2004, whose approaches will be discussed further below. Everett does consider the major/minor system as one option in rock, but notes that songs in “pure” minor are uncommon (2004, paragraph 7). 3. By all accounts, rock songs are generally tonal in the broadest sense of having a focal pitch class or tonal center. In light of this, it makes sense to represent scale collections in relative terms—in relation to the tonic—rather than in terms of absolute pitch classes. 4. A word is needed about my use of the term “creators.” Following the usual convention of pop/rock scholarship, I define a “song” as a particular recording by a particular artist or group. It should be borne in mind, however, that the creation of a rock song is almost always a complex collaborative effort. Obviously, the writers of a song deserve a substantial share of the credit for it; in some cases, they are not members of the performing group. (Songwriters are identified in the attached discography.) Yet the performers of a song may also contribute to it in ways that are relevant to the issues in this paper—in particular, contributions that affect the pitch content of the song. To disentangle the contributions of these various individuals is often difficult or impossible, however, and I do not attempt it here. 5. de Clercq and Temperley 2011 reports analyses of ninety-nine songs; since then, we have analyzed an additional 101 songs. The website www.theory.esm.rochester.edu/rock_corpus contains our analyses of all 200 songs. 7. It is difficult to find any progression containing 2ˆ or 4ˆ that is at all common in popular music. Perhaps the closest candidate is I–II–IV–I (with II containing 4ˆ), which forms the basic progression in several well-known songs, including the Beatles’ “Eight Days A Week,” “You Won’t See Me,” and “Sergeant Pepper’s Lonely Hearts Club Band” (verse); the Faces’ “Stay With Me”; and Dishwalla’s “Counting Blue Cars.” Admittedly, the 4ˆ degree does not sound particularly unstable or disruptive in this context; I am unable to explain why. (An anonymous reviewer points out that it might arise as a harmonization of the chromatic line ^5– 4ˆ–4ˆ–3̂.) It has also been noted that Phrygian mode (containing 2ˆ) is common in some types of heavy metal (Walser 1993, 46; Biamonte 2010, 108). 8. The 4ˆ here is undoubtedly non-harmonic, and is resolved by step. (It is either three separate non-chord-tones, or—perhaps more plausibly—a single incomplete neighbor that itself is ornamented by upper-neighbor Ds.) But it is emphasized much more than the typical non-chord-tone. 9. The chorus of the song employs a major VI chord (in C), including the 1ˆ degree—again, the same pitch class (C /D ). This pitch is barely audible in the first chorus, more so in the second when it is sustained by the lead guitar in a high register. 10. The line of fifths was first proposed by Regener 1974; in Temperley 2001, I present it as a general framework for the cognitive representation of pitch classes in common-practice music and rock as well. To my knowledge, it has not been applied to popular music by other authors. The approach of Capuzzo 2009 is related, however; Capuzzo represents pitch collections in rock using “5-cycles,” which are essentially sets of adjacent positions on the line. 11. While the positive and negative connotations of major and minor (respectively) have been well established by experimental work (see Gabrielsson and Lindström 2001 for a review), the emotional connotations of diatonic modes have received little attention. With regard to popular music scholarship, the idea that scales carry emotional connotations appears to be quite widely accepted, but it has been discussed only in passing. Some authors have invoked the conventional associations of major and minor keys (Stephenson 2002, 149–50; Walser 1993, 165); while the applicability of the major/minor system to rock is doubtful (as discussed earlier), there is clearly a parallel between major/minor keys and “sharp-side/flat-side” collections in rock, both in terms of their line-of-fifths positions and their emotional associations. Occasional comments are also found on the connotations of diatonic modes. Middleton comments that modes with the raised seventh have an effect of “yearning” and “progress” while the lowered seventh represents “stability and realism” (1972, 166); Björnberg describes the effect of Aeolian mode as one of “stasis” and “coldness” (1985, 4); Moore writes that Aeolian implies “resignation,” while Dorian “at least carries the illusory possibility of escape” (1995, 188); Covach suggests that the effect of Dorian mode in Yes’s “Close to the Edge” is “primitive” and “chaotic,” in contrast to the “refined” and “life-affirming” effect of major mode (1997, 18). Again, however, the expressive meaning of scales in rock has not, to my knowledge, received any systematic treatment. 12. Admittedly, the correspondence between scale content and lyrics is only approximate. The last four measures of the VCU also touch on the “night” (“but when I get home to you...”). This shift in focus within the VCU is reflected not so much in scale content, but rather in texture: While the melody and accompaniment of the first eight measures are relatively independent, the last four measures reflect a close coordination. See Temperley 2007 for further discussion. 13. Wagner notes a general strategy in the Beatles’ early music of combining what he calls “blues” sections—those that employ I, IV, and V with added 3̂ and 7ˆ—with “lyric” sections employing ii, vi, and iii (2003, 355). 14. It could also be called a diatonic hexachord, but this term is indeterminate as to the location of the tonal center. 15. In scalar terms, one could view the cadential IV as returning to the primary Ionian collection or anticipating the Mixolydian scale of the link; Example 16 represents the latter option. 16. 5ˆ does not occur over the VII in the first chorus, but it appears at the parallel point in the third chorus (see Example 1b). 17. One might point to applied chords, such as the V/vi in “Goodbye Yellow Brick Road” (Example 18c), which introduces 5ˆ, the leading-tone of vi. I would suggest, however, that applied chords such as this are better understood as implying a (momentary) shift of tonic, rather than implying a shift of scale in relation to a fixed tonic. The relationship between scalar shifts and tonal shifts is complex; I return to it below. 18. The parallel point in the first verse is also of interest. The lyric here, “I was surprised I must say,” conveys a sense of ironic politeness and detachment that is nicely expressed by the sharpward move to vi. (A kind of musical sarcasm, perhaps.) In this case, however, the vocal maintains 3̂ over the vi chord, so the musical effect is more acerbic. Stephenson analyzes this song from a different perspective (2002, 49–51). For him, the issue is whether the song is in major or minor mode; he suggests that this is initially ambiguous, due to the absence of a full major or minor tonic triad in the introduction and verse. I find this puzzling, since elsewhere Stephenson generally avoids applying the major/minor dichotomy to rock and indeed explicitly rejects it (42–43)—correctly, in my view. 19. A similar pattern of scalar shifts is seen in “Stomp,” by the Brothers Johnson. The verse is in Dorian; the pre-chorus moves to Ionian; the chorus shifts in the opposite direction to Aeolian, but with an emphatic IV at the end of the section, returning to Dorian for the link. Again, the result is an “S-shaped” trajectory over the entire VCU. 20. The Beatles’ “A Hard Day’s Night” (discussed earlier, Example 7) reverses this pattern, employing 3̂ only at the end of the verse-refrain melody, 3̂ elsewhere. The Beatles’ “Fixing a Hole” alters the pattern in another way: 3̂ appears only in the initial chord of the verse, yielding to 3̂ for the remainder of the section. 21. An analogy might be drawn with classical minor, where the 7ˆ degree has a harmonic function as part of the V triad. Indeed, even in rock, the V triad is sometimes used in “flat-side” contexts (i.e., contexts with 3̂ rather than 3̂). This is relatively rare, however, and when it occurs, it usually involves paradigms that are clearly derived from common-practice harmony, most notably the descending tetrachord i– VII– VI–V. This is seen, for example, in the Mamas and Papas’ “California Dreamin’,” Heart’s “Crazy on You,” and the chorus of the Police’s “Synchronicity II” (Example 13), as well as some chromatic descending tetrachord patterns to be discussed below. 22. Another option would be to introduce distinctions of importance or prominence within the scale representation itself—essentially, treating scale membership as a matter of “more or less” rather than “all or nothing.” One could show such distinctions, for example, by allowing rectangles of different heights in the line-of-fifths representation. (This brings to mind the “basic space” of Lerdahl 2001, which represents scale degrees with a five-level hierarchy of stability: tonic, tonic/fifth, tonic-triad, diatonic, and chromatic.) This approach also has drawbacks, however. It further increases the complexity and subjectivity of the analytical system. And in many cases, as noted above, treating a scale as an essentially “all-or-nothing” scale degree set that sets the emotional tone of an entire song or section seems quite satisfactory. 23. A survey of research on music and emotion by Gabrielsson and Lindström concludes that the studies reviewed “show similar results converging on two main emotion dimensions: valence (pleasantness–unpleasantness, gaiety–gloom) and activity/arousal (tension–relaxation, excited–calm)” (2001, 226). Happiness is perhaps not quite equivalent to positive valence, as it also implies a certain degree of positive arousal; sadness is negative in both valence and arousal. 24. This brings to mind Stephenson’s theory of harmonic systems, described earlier. The weirdness of Example 27 is nicely predicted by Stephenson’s theory, actually, since i and vi do not occur together in any of his three harmonic systems. 25. The term “modulation” might also be used, though this may invoke unwanted associations with the common-practice major/minor system. 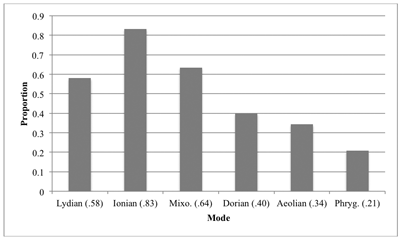 See Capuzzo 2009 for a recent exploration of tonal shifts in rock songs; see also Stephenson 2002, 47–52, and Everett 2008, 142–45. Tonal shift also plays an important role in several analytical essays on individual songs, such as Boone 1997, Burns 2008, and Koozin 2008. 26. This view of the VII–IV–I progression implies that the major scale has primacy in rock, and that moves outside of this scale cause us to search for alternative tonal centers; there is other evidence for this as well, as I have discussed. Following a common convention, I represent major triads with upper-case Roman numerals, minor triads with lower-case. Scale degrees and roots within the major scale are represented by plain integers and Roman numerals, respectively; others are indicated by a preceding “ ” or “ ”. Keys are represented as pitch classes only, not as major or minor; this will be explained below. Note that common-practice minor is not the same as Aeolian mode, or any other diatonic mode; it is most closely approximated by the harmonic minor scale (1ˆ–2ˆ– 3̂–4ˆ–5ˆ– 6ˆ–7ˆ), but also has distinct ascending and descending melodic scales. (Alternatively, and perhaps preferably, it can be viewed as having a single scale with a flat third and variable sixth and seventh degrees.) The application of the major/minor system to rock is discussed and rejected by Covach (1997, 10–11), Stephenson (2002, 42–3), and Burns (2008, 65). This point is also often made implicitly: theorists who propose tonal classification schemes for popular music generally do not use major and minor keys, but rather employ either diatonic modes or alternative custom-made systems. See for example Moore 1992, Stephenson 2002, and Everett 2004, whose approaches will be discussed further below. Everett does consider the major/minor system as one option in rock, but notes that songs in “pure” minor are uncommon (2004, paragraph 7). By all accounts, rock songs are generally tonal in the broadest sense of having a focal pitch class or tonal center. In light of this, it makes sense to represent scale collections in relative terms—in relation to the tonic—rather than in terms of absolute pitch classes. A word is needed about my use of the term “creators.” Following the usual convention of pop/rock scholarship, I define a “song” as a particular recording by a particular artist or group. It should be borne in mind, however, that the creation of a rock song is almost always a complex collaborative effort. Obviously, the writers of a song deserve a substantial share of the credit for it; in some cases, they are not members of the performing group. (Songwriters are identified in the attached discography.) Yet the performers of a song may also contribute to it in ways that are relevant to the issues in this paper—in particular, contributions that affect the pitch content of the song. To disentangle the contributions of these various individuals is often difficult or impossible, however, and I do not attempt it here. de Clercq and Temperley 2011 reports analyses of ninety-nine songs; since then, we have analyzed an additional 101 songs. The website www.theory.esm.rochester.edu/rock_corpus contains our analyses of all 200 songs. It is difficult to find any progression containing 2ˆ or 4ˆ that is at all common in popular music. Perhaps the closest candidate is I–II–IV–I (with II containing 4ˆ), which forms the basic progression in several well-known songs, including the Beatles’ “Eight Days A Week,” “You Won’t See Me,” and “Sergeant Pepper’s Lonely Hearts Club Band” (verse); the Faces’ “Stay With Me”; and Dishwalla’s “Counting Blue Cars.” Admittedly, the 4ˆ degree does not sound particularly unstable or disruptive in this context; I am unable to explain why. (An anonymous reviewer points out that it might arise as a harmonization of the chromatic line ^5– 4ˆ–4ˆ–3̂.) It has also been noted that Phrygian mode (containing 2ˆ) is common in some types of heavy metal (Walser 1993, 46; Biamonte 2010, 108). The 4ˆ here is undoubtedly non-harmonic, and is resolved by step. (It is either three separate non-chord-tones, or—perhaps more plausibly—a single incomplete neighbor that itself is ornamented by upper-neighbor Ds.) But it is emphasized much more than the typical non-chord-tone. The chorus of the song employs a major VI chord (in C), including the 1ˆ degree—again, the same pitch class (C /D ). This pitch is barely audible in the first chorus, more so in the second when it is sustained by the lead guitar in a high register. The line of fifths was first proposed by Regener 1974; in Temperley 2001, I present it as a general framework for the cognitive representation of pitch classes in common-practice music and rock as well. To my knowledge, it has not been applied to popular music by other authors. The approach of Capuzzo 2009 is related, however; Capuzzo represents pitch collections in rock using “5-cycles,” which are essentially sets of adjacent positions on the line. While the positive and negative connotations of major and minor (respectively) have been well established by experimental work (see Gabrielsson and Lindström 2001 for a review), the emotional connotations of diatonic modes have received little attention. With regard to popular music scholarship, the idea that scales carry emotional connotations appears to be quite widely accepted, but it has been discussed only in passing. Some authors have invoked the conventional associations of major and minor keys (Stephenson 2002, 149–50; Walser 1993, 165); while the applicability of the major/minor system to rock is doubtful (as discussed earlier), there is clearly a parallel between major/minor keys and “sharp-side/flat-side” collections in rock, both in terms of their line-of-fifths positions and their emotional associations. Occasional comments are also found on the connotations of diatonic modes. Middleton comments that modes with the raised seventh have an effect of “yearning” and “progress” while the lowered seventh represents “stability and realism” (1972, 166); Björnberg describes the effect of Aeolian mode as one of “stasis” and “coldness” (1985, 4); Moore writes that Aeolian implies “resignation,” while Dorian “at least carries the illusory possibility of escape” (1995, 188); Covach suggests that the effect of Dorian mode in Yes’s “Close to the Edge” is “primitive” and “chaotic,” in contrast to the “refined” and “life-affirming” effect of major mode (1997, 18). Again, however, the expressive meaning of scales in rock has not, to my knowledge, received any systematic treatment. Admittedly, the correspondence between scale content and lyrics is only approximate. The last four measures of the VCU also touch on the “night” (“but when I get home to you...”). This shift in focus within the VCU is reflected not so much in scale content, but rather in texture: While the melody and accompaniment of the first eight measures are relatively independent, the last four measures reflect a close coordination. See Temperley 2007 for further discussion. Wagner notes a general strategy in the Beatles’ early music of combining what he calls “blues” sections—those that employ I, IV, and V with added 3̂ and 7ˆ—with “lyric” sections employing ii, vi, and iii (2003, 355). It could also be called a diatonic hexachord, but this term is indeterminate as to the location of the tonal center. In scalar terms, one could view the cadential IV as returning to the primary Ionian collection or anticipating the Mixolydian scale of the link; Example 16 represents the latter option. 5ˆ does not occur over the VII in the first chorus, but it appears at the parallel point in the third chorus (see Example 1b). One might point to applied chords, such as the V/vi in “Goodbye Yellow Brick Road” (Example 18c), which introduces 5ˆ, the leading-tone of vi. I would suggest, however, that applied chords such as this are better understood as implying a (momentary) shift of tonic, rather than implying a shift of scale in relation to a fixed tonic. The relationship between scalar shifts and tonal shifts is complex; I return to it below. The parallel point in the first verse is also of interest. The lyric here, “I was surprised I must say,” conveys a sense of ironic politeness and detachment that is nicely expressed by the sharpward move to vi. (A kind of musical sarcasm, perhaps.) In this case, however, the vocal maintains 3̂ over the vi chord, so the musical effect is more acerbic. A similar pattern of scalar shifts is seen in “Stomp,” by the Brothers Johnson. The verse is in Dorian; the pre-chorus moves to Ionian; the chorus shifts in the opposite direction to Aeolian, but with an emphatic IV at the end of the section, returning to Dorian for the link. Again, the result is an “S-shaped” trajectory over the entire VCU. The Beatles’ “A Hard Day’s Night” (discussed earlier, Example 7) reverses this pattern, employing 3̂ only at the end of the verse-refrain melody, 3̂ elsewhere. The Beatles’ “Fixing a Hole” alters the pattern in another way: 3̂ appears only in the initial chord of the verse, yielding to 3̂ for the remainder of the section. An analogy might be drawn with classical minor, where the 7ˆ degree has a harmonic function as part of the V triad. Indeed, even in rock, the V triad is sometimes used in “flat-side” contexts (i.e., contexts with 3̂ rather than 3̂). This is relatively rare, however, and when it occurs, it usually involves paradigms that are clearly derived from common-practice harmony, most notably the descending tetrachord i– VII– VI–V. This is seen, for example, in the Mamas and Papas’ “California Dreamin’,” Heart’s “Crazy on You,” and the chorus of the Police’s “Synchronicity II” (Example 13), as well as some chromatic descending tetrachord patterns to be discussed below. Another option would be to introduce distinctions of importance or prominence within the scale representation itself—essentially, treating scale membership as a matter of “more or less” rather than “all or nothing.” One could show such distinctions, for example, by allowing rectangles of different heights in the line-of-fifths representation. (This brings to mind the “basic space” of Lerdahl 2001, which represents scale degrees with a five-level hierarchy of stability: tonic, tonic/fifth, tonic-triad, diatonic, and chromatic.) This approach also has drawbacks, however. It further increases the complexity and subjectivity of the analytical system. And in many cases, as noted above, treating a scale as an essentially “all-or-nothing” scale degree set that sets the emotional tone of an entire song or section seems quite satisfactory. A survey of research on music and emotion by Gabrielsson and Lindström concludes that the studies reviewed “show similar results converging on two main emotion dimensions: valence (pleasantness–unpleasantness, gaiety–gloom) and activity/arousal (tension–relaxation, excited–calm)” (2001, 226). Happiness is perhaps not quite equivalent to positive valence, as it also implies a certain degree of positive arousal; sadness is negative in both valence and arousal. This brings to mind Stephenson’s theory of harmonic systems, described earlier. The weirdness of Example 27 is nicely predicted by Stephenson’s theory, actually, since i and vi do not occur together in any of his three harmonic systems. The term “modulation” might also be used, though this may invoke unwanted associations with the common-practice major/minor system. See Capuzzo 2009 for a recent exploration of tonal shifts in rock songs; see also Stephenson 2002, 47–52, and Everett 2008, 142–45. Tonal shift also plays an important role in several analytical essays on individual songs, such as Boone 1997, Burns 2008, and Koozin 2008. This view of the VII–IV–I progression implies that the major scale has primacy in rock, and that moves outside of this scale cause us to search for alternative tonal centers; there is other evidence for this as well, as I have discussed.